A story that made the rounds this week highlights a growing challenge for commercial property owners and commericial property management companies. 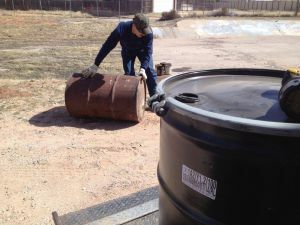 According to the NBC news affiliate in Denver, Colorado a construction site owner found three (3) 55-gallon drums of hazardous waste dumped illegally on his property. Illegal dumping on commercial property is a big problem in the United States, particularly problematic for commercial property owners and managment companies. Commercial properties have long been targets because of the ease of access to their municipal dumpsters associated with buildings and manufacturing facilities. Building, warehouses and manufacturing facilities that have easy access and light security are particularly vulnerable to unwanted dumping, leaving commercial property owners with a mess to clean up and expensive disposal costs if the materials being dumped are toxic. What many commercial property owners do not realize is that once hazardous materials are left on your property, whether through illegal dumping activities or from a vacated tenant, the liability for cleanup switches to the property owner. Absorbing the losses that come from toxic materials left on your property is a headache that most of us do not want to deal with. There are a few steps that commercial property owners and property managers can take to reduce the likelihood of being stuck with an unwanted cleanup bill. Protect your property by adding surveillance cameras and a video backup system. When possible lock up your property and/or hire a security patrol. Make sure that you are in communication with both tenants and neighbors and advise them of steps that you are taking to curb illegal dumping activities. Have phone numbers of local police and fire agencies to contact in the event of an emergency. 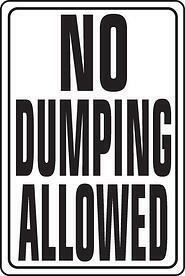 Most states have laws on the books to combat illegal dumping. Penalties include fines, confiscation of property (such as automobiles) and possible incarceration for these illegal activities. Reporting suspicious activities can go a long way towards limiting these activities in your community and sending a clear message that you will not tolerate illegal dumping in your community. If you find yourself with hazardous or toxic chemicals dumped or left behind on your commercial property, there are a few steps to take. It is important that you notify the local authorities including your local police and fire departments. There is a good chance that you are not the only local victim, and notifying the authorities will provide clues in the event that the perpetrators are dumping other local businesses. In the event that drums of hazardous waste are left behind, it is crucial that you do not open them to inspect the contents. There is no telling what type of substance is in there and a trained and certified hazardous waste professional or hazardous material expert from the fire department should evaluate the left-behind materials. For commercial property owners it is good business practice to establish a relationship with a certified and qualified hazardous waste company. Having a trusted company on speed dial is always a good idea. For a free quote on removing hazardous waste left behind on your commercial property, click on the link below for a speedy response.